Recently, the comparison between the legendary Big Brother player Dan Gheesling and this season's Derrick has come up a lot in Big Brother conversation. Dan, who played on Season 10 (and won) and Season 14, is known to be many Big Brother fans' favorite player to play the game... including Derrick. In Derrick's CBS bio, he mentions Dan as the past cast member he liked the most. And when Dan appeared on Wednesday's live show and spoke to Julie Chen, we learned that he is a fan of Derrick's game play. So what could be the problem? Derrick likes Dan's game, Dan likes Derrick's game. People think Derrick is playing a lot like Dan. I should probably be content with this. But I don't know how fair it is to be comparing Dan and Derrick's game, because to me, that would be comparing apples and oranges. 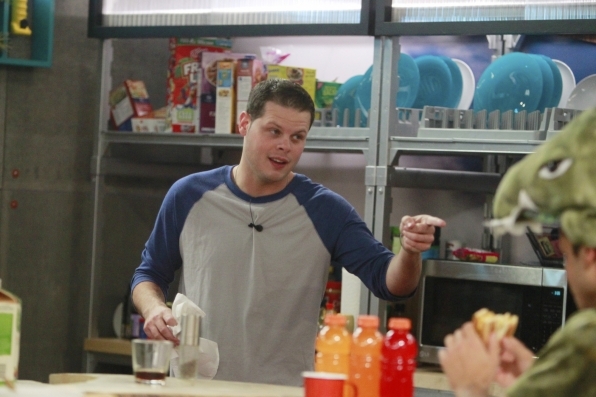 Sure, Derrick is the most strategic, dynamic, well thought-out player Big Brother has this season... But when you're playing with 15 people who think they are at summer camp and not playing Big Brother, is it really that hard to stand out as a good game player? Derrick has made some really smart game moves from the beginning. 1) He didn't reveal that he was a cop. He knew that by revealing something like that, it would cause an unnecessary paranoia that would only hurt his game. Good move. 2) He did as little as possible to get blood on his hands early on. Again, a really good game move. But the thing about Derrick is that he doesn't have anyone playing an equally strategic game. If Derrick were playing the same game with real game players, not people that vote with a pack mentality, it would be a completely different story. Dan, on the other hand, played with players like Memphis in Season 10, or legends like Mike, Janelle, and Britney, as well as new players but great competitors, like Ian, Frank, Danielle, and Shane in Season 14. While Derrick tried to plan his own "funeral" this past week, with Victoria's help, he didn't really need to do it to get himself out of a bind. When Dan held his famous funeral, he was in a lot of trouble; blood up to his elbows, as he would describe it. Derrick's game moves are all to set himself up for the final two, which is smart, but when you're playing with people that don't question anything you do, it's not that hard to be called the best game player of the season. Now, if Derrick were to make a shocking final three move that no one saw coming, that would be comparable to Dan Gheesling. Here's what Big Brother fans are saying. It seems the people have spoken!